When installing the third maintenance release for SAS 9.2 in a multiple machine deployment, you must apply the maintenance release in a specific order. For more information, see “Installation Order Rules for Multiple Machine Deployments” in the SAS Intelligence Platform: Installation and Configuration Guide. 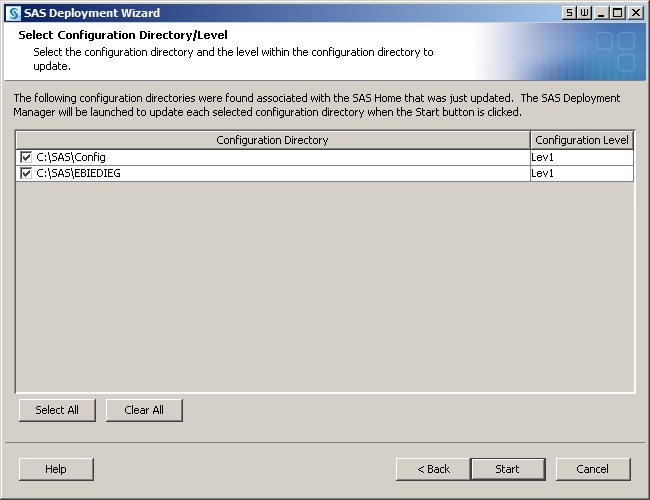 Note: If you are installing in a z/OS environment, see the installation and maintenance instructions in Installation Note 36008 at http://support.sas.com/kb/36/008.html. Note: To specify a different version of the Java Runtime Environment (JRE) that you want to use with the SAS Java applications, see “Specify a Different JRE” in the SAS Intelligence Platform: Installation and Configuration Guide. Terminate all active SAS sessions, daemons, spawners, and servers. It is important to stop the SAS servers in the inverse order that they were started. For more information, see “Overview of Server Operation” in the SAS Intelligence Platform: System Administration Guide. Note: When you start the installation process, the System Requirements Wizard runs, and you might need to reboot your machine. If this happens, you must terminate all active SAS sessions, daemons, spawners, and servers again. Note: If you click Cancel, then you will have installed but not configured your software updates. You must configure the updated SAS products before you can run the maintenance release. To complete these configuration steps at a later time, see “Configure Updated or Upgraded SAS Products” in the SAS Intelligence Platform: Installation and Configuration Guide. To continue the configuration steps, restart the SAS Metadata Server manually.If you are running in a UNIX environment, you must manually restart the SAS Metadata Server. At a UNIX prompt, navigate to the directory where the SAS Metadata Server is configured. Type ./MetadataServer.sh start. 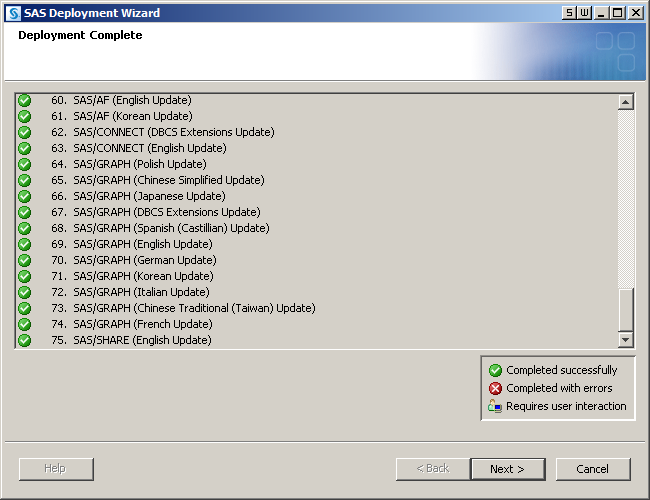 When the configuration is complete, the Deployment Summary opens. You need this file in step 11. For more information, see About the Deployment Summary. Review the list of products in the Update Summary section of the Deployment Summary. For each product that was updated, determine whether there are any additional configuration steps that you need to complete. For more information, see Product-Specific Details and Post-Configuration Requirements.